Search for the best flight prices from Manchester to Enfidha. Compare prices, book today and save money with Manchester Airport. Fly into Enfidha’s Zine El Abidine Ben Ali International Airport and you’re far likelier to be en route to the fabulous coastal resorts of Hammamet, Sousse, Skanes, Port El Kantaoui and Monastir, rather than this bustling town of 10,000. With fine sandy beaches and plentiful watersports, there’s no shortage of reasons to come, stay and explore the whole area around Cap Bon and beyond. Enfidha is the jumping-off point to the Mediterranean resorts of Hammamet and Sousse. Cosseted by miles of white-sand beach, these Tunisian seaside towns offer sun-filled fun with a healthy dollop of history and culture thrown in. In Hammamet, the Yasmine Zone Touristique is where to search for luxury accommodation. Hasdrubal Thalassa & Spa (4 Zone Touristique) has rooms kitted out with sumptuous Moorish-inspired décor. If you're looking for a bargain, Sousse has more mid-range and budget choices with both Marhaba Beach Sousse (Boulevard 7 Novembre) and El Hana Palace Caruso Hotel (Boulevard 14 Janvier) offering smart deals for families looking for a holiday that won't break the bank. Copper and brassware, hand-painted ceramic tiles, leather goods and traditional Berber textiles are just some of Tunisia's handicrafts you can take home. 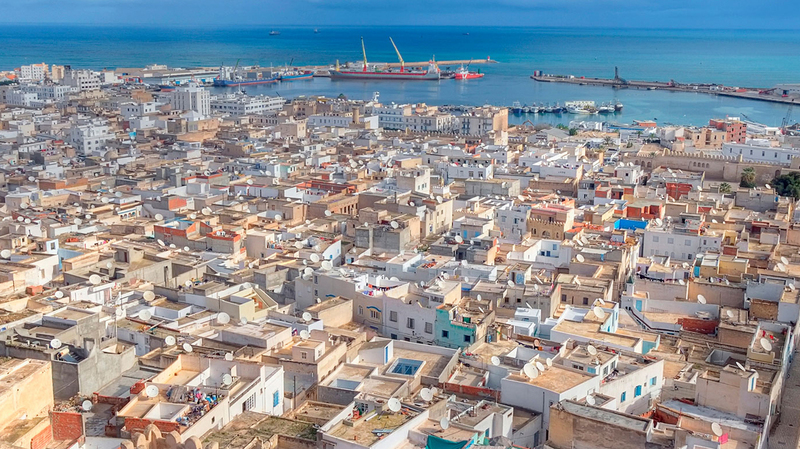 The best place to look for locally made goods is Sousse's medina (Old Town). Hemmed in by whitewashed houses, these labyrinthine alleyways are the most atmospheric place to shop. If bargaining isn't your thing, try the Soula Shopping Centre (Place des Martyrs) at the medina entrance. Here you'll find fixed-price, high-quality crafts from across the country. If you're staying in Hammamet, be aware that prices in shops within the Yasmine Zone Touristique are hugely inflated. It's worth your while to take a day trip to Sousse to shop. Tunisian cuisine is a blend of sunny Mediterranean dishes, rich with lashings of olive oil, and spicy North African flavours spiked by generous spoonfuls of hot harissa paste. Sousse's top dining is at Restaurant Marmite (8 rue Remada) where the seafood is the best in town. Cheaper meals are best searched out in the medina. Inside the swirl of alleyways, Cafe Seles (42 rue Abou Nawas) serves up rustic Tunisian treats and is a local favourite. For special-occasion dining in Hammamet, Le Barberousse (Ville Arabe de Hammamet) and Chez Achour (Rue Ali Belouare) serve up seafood dishes packed with tasty flair. Run in conjunction with the International Festival of Hammamet, this little festival celebrates tourism with a series of events staged in Hammamet's Zone Touristique. A crammed programme of music concerts featuring Tunisian artists in a variety of genres, including pop, rock and jazz, plus theatre events by leading local and French acting troupes buzzes through Hammamet for six weeks. This six-week extravaganza's main event is the Sousse Carnival which features the largest float parade in Africa. There's also a host of art exhibitions and concerts run over the weeks leading up to the parade. The ninth month of the Islamic calendar is a time of fasting during the day and feasting at night. Both Sousse and Hammamet are quiet during daylight but after dusk people flock to the streets to socialise. It's a wonderful time to experience Tunisian culture. The town of Kalaa Debira celebrates its olive trees with folk dancing and music, olive oil tastings and stalls selling souvenirs of olive tree wood for this event.